I – This recipe is a staple I like to make when the weather gets cold. Nothing like comfort food, a blanket and a good TV show… Better yet if it’s your boyfriend cooking it for you! First, prep all of the ingredients – chop one large onion, 2 ribs of celery and 3 medium potatoes into bite sizes. 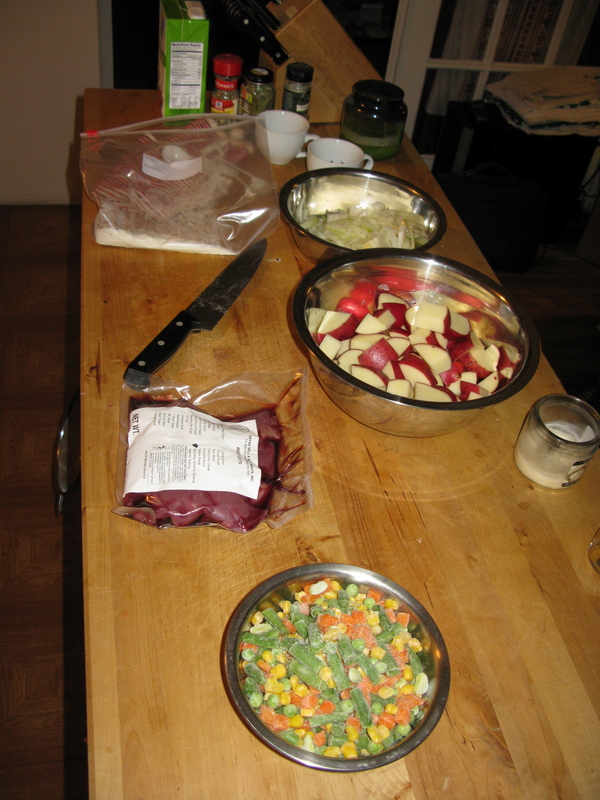 You’ll also need some frozen vegetables (the one we used had carrots, peas, corn and green beans). Put 1lb (0.5Kg) cubed beef in a bag and add 2.5 tbsp of all-purpose flour. Close the bag and mix well (make sure the meat is well coated, it will crisp nicely. 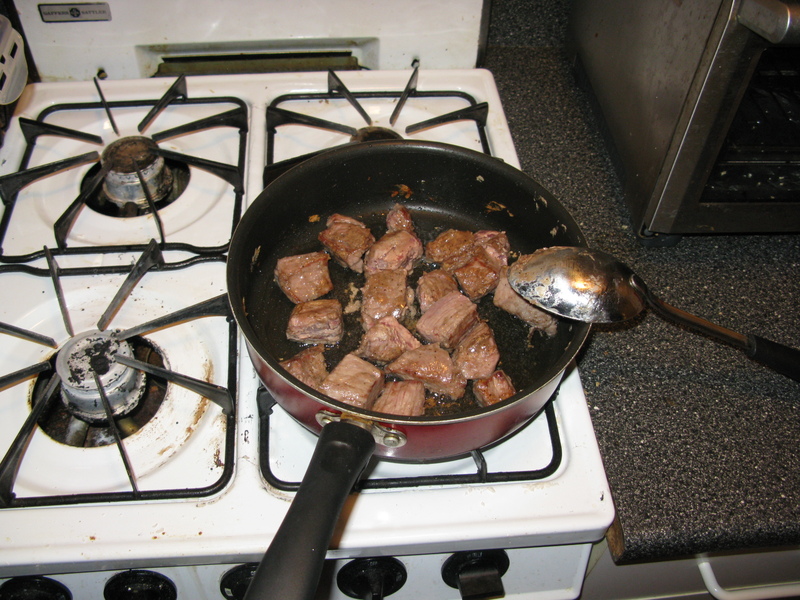 In a frying pan, brown meat in a little bit of olive oil. 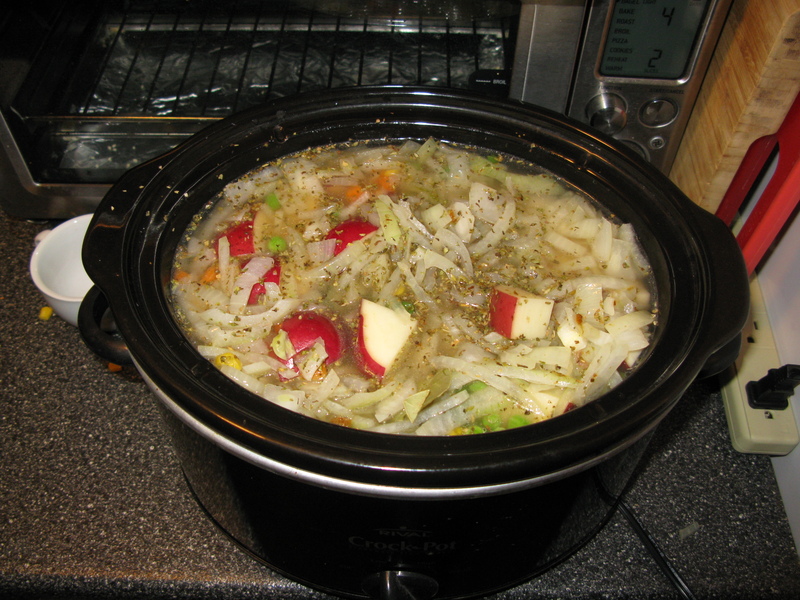 Once browned, put meat and vegetables in the slow cooker. In a bowl mix 2 cups of vegetable broth, 1 cup water, 1 tbsp Worcestershire sauce (for the Portuguese readers, this is what we call molho inglês), 1 beef bouillon cube, 1 tsp oregano, 1/2 tsp marjoram and pepper. Pour it over the meat an vegetables and add one bay-leaf. Our 4qt (~3.75L) slow cooker ended up filled to the brim. Cook on low for 12 hours or on high for 6 hours. You will end up with the most delicious vegetables ever. Plus if you do this during the day on the weekend, the whole apartment and the building hallways will smell delicious all day. The only slight issue we had this time was that the meat we used had very little fat, so it ended up a bit dry. But it disappeared in no time anyway, so no complaints! This entry was posted in Meat, Stews & Other Things in Pots by Ines. Bookmark the permalink.